Vast Public Indifference: Charles Torrey, "Martyr for Liberty"
I've been watching Ken Burns' The Civil War this week as I update and revise my book lists for my general exams. Even though I know that Burns' reconciliationist narrative doesn't really fly with academic historians, I still enjoy the program. At the very least, it beats reading Battle Cry of Freedom again. This time, as I watched, I reflected on how much Burns has shaped what I (and many others) know about the Civil War. For example, the murder of Elijah P. Lovejoy is a well-known incident in antebellum abolitionism that has undoubtedly enjoyed a resurgence in notoriety due to Burns' PBS series. Lovejoy was not the only abolitionist martyr of the antebellum period, but his inclusion in The Civil War has given his story new prominence in the minds of modern Americans. Burns could just as easily have chosen to include the story of Rev. Charles Torrey in his documentary. 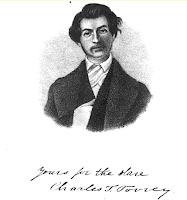 I had never heard of Charles Torrey before I stumbled across his grave at Mount Auburn, but his epitaph made me think that I probably should have. as a Martyr for Liberty. Yale-trained minister dies in Southern jail as "Martyr for Liberty"? That seemed like something I should hae heard about. Turns out that Torrey was actually jailed several times for crimes such as attending a slaveholder's convention as an undercover reporter and assisting the escape of nearly 400 slaves from Maryland and Northern Virginia. He was sentenced to six years of hard labor in Baltimore, but died of tuberculosis in 1846. You can read his memoirs and letters on Google Books. Torrey's impressive obelisk has its own island in the middle of one of Mount Auburn Cemetery's internal roads, where it is surrounded by flowers. A bas relief of Torrey's bust (toga-clad, natch) embellishes the monument. Though the marble is cracking, it is still quite beautiful. It is better to die in prison with the peace of God in our breasts than to live in freedom with a polluted conscience. Whoever erected the monument wanted to make extra certain that viewers understood that Torrey was a MARTYR, so he/she/they topped it off with a crown of thorns. Though largely forgotten in our day, Torrey was a celebrated figure in New England's abolitionist circles. Rev. 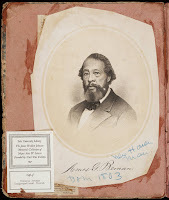 Amos Beman, an African-American minister from New Haven had a grandson named Charles Torrey Beman who fought with the 5th MA Cavalry in the Civil War (and kept a journal). I don't know whether Charles Torrey Simpson, celebrated botanist, was named for the abolitionist, but since he was born in June of 1846, I think there's a good chance that he was. Maybe I can find some way to slip this into my general exams . . . it might convince certain of my examiners that I'm not just wasting my time wandering around old graveyards.